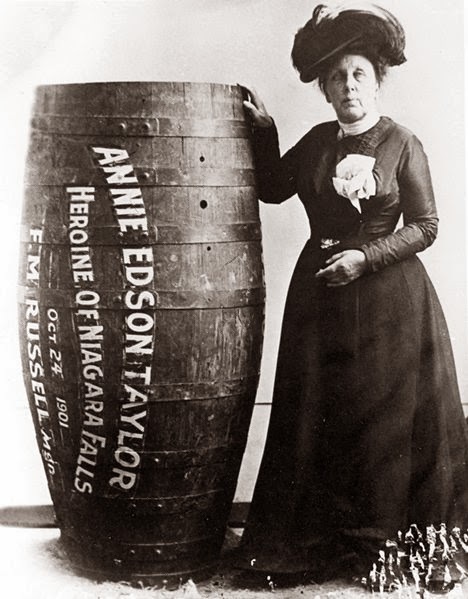 One hundred and twelve years ago today, a daredevil climbed into a barrel, plunged over Niagara Falls, and survived! Was this some wild, risk-taking teen who didn't know any better? Was it a professional stuntman who regularly risked life and limb? Okay, how about a retired teacher celebrating her 63rd birthday? After the twenty-minute trip, Annie Edison Taylor emerged with only a small gash on her head. Even if you are a super-duper, kick-A retired teacher. PROMPT: It’s a great week for some daring historical fiction featuring tightrope walkers, human cannonballs, and barnstormers. Pick a wacky adventurer and enjoy the ride — from the serene and snug safety of your office chair. Dude -- Cannon + Pieces + Dying Breath = NO Niagara Falls trip for you.